Bollom Flameguard Ultra Acrylic Eggshell is a top coat for Bollom Broflame Ultra Basecoat on bare and previously painted wood, and Bollom Brosteel Ultra 60 for steel. 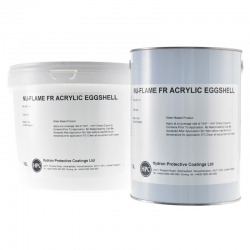 Bollom Flameguard Ultra Acrylic Eggshell is a top coat for Bollom Broflame Ultra Basecoat on bare and previously painted wood, and Bollom Brosteel Ultra 60 and for steel. 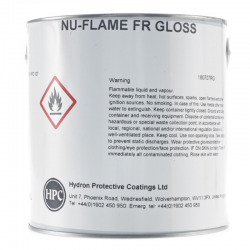 Bollom Flameguard Ultra Acrylic Eggshell can also provide Class 0 on bare and previously painted non-combustible surfaces. Ensure the surface to be painted is sound, clean, dry and free from grease or any substance liable to give adhesion problems. Scrape off any old or flaking paint until you have a firm well adhered surface; if in doubt remove all existing coatings. For existing gloss and eggshell finishes wet abrade and rinse with clean water to remove any residues. 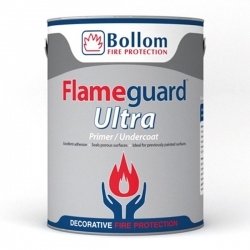 Always apply Bollom Flameguard Ultra Primer / Undercoat prior to applying Bollom Flameguard Ultra Acrylic Eggshell. 4hrs @ 20°C per coat. Allow to dry for a minimum of 4hrs @ 20°C between coats. For details on this please see our blog Painting the Walls around a Fireplace or Multi Fuel Stove.